Here is a list of best free Raw Image Editor Software for Windows. 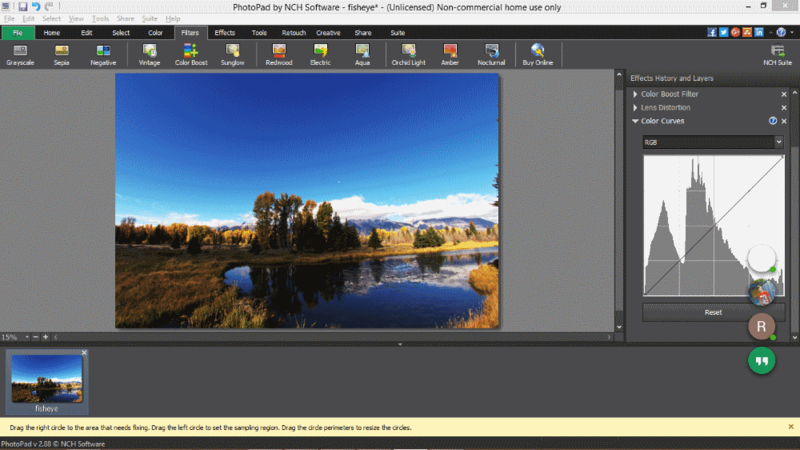 These software not only let you open and edit Raw photos, but also Bitmap photos. In the following list, you will find dedicated Raw Image Editors as well as general Image Editors that support Raw and other image formats. Some of these software to edit Raw photos are packed with advanced Image editing tools, while some let you perform basic image editing. Using these Raw image editor software, you will be able to carry out various adjustments and manipulations on your photos, such as: Color adjustments, Levels adjustments, Lighting adjustments, Photo enhancement, Image ransformation, etc. You can also add numerous effects and filters on your photos using these. In case you want to add text or objects to your Raw photos, you can do that as well using these free Raw image editors for Windows. These Raw Photo Editors let you edit almost all Raw formats of different camera brands, such as: SRW, TIF, STI, ARW, MOS, NEF, ORF, PEF, PDC, MEF, SR2, NRW, DC2, BMQ, PW2, KC2, MRW, BAY, SRF, KDC, MDC, DNG, CR2, CS1, etc. Go through the list to find out more about the image editing capabilities of these Raw Image editors. You will also find out how to edit RAW photos using these software. I like RawTherapee and UFRaw the most, as these are professional Raw photo editors and provide a wide array of photo editing tools. These also support almost all known Raw image formats. Go ahead and give them a try. You can also checkout the list of best free Photo Noise Reduction Software, Fisheye Remover Software, and Red Eye Remover Software for Windows. 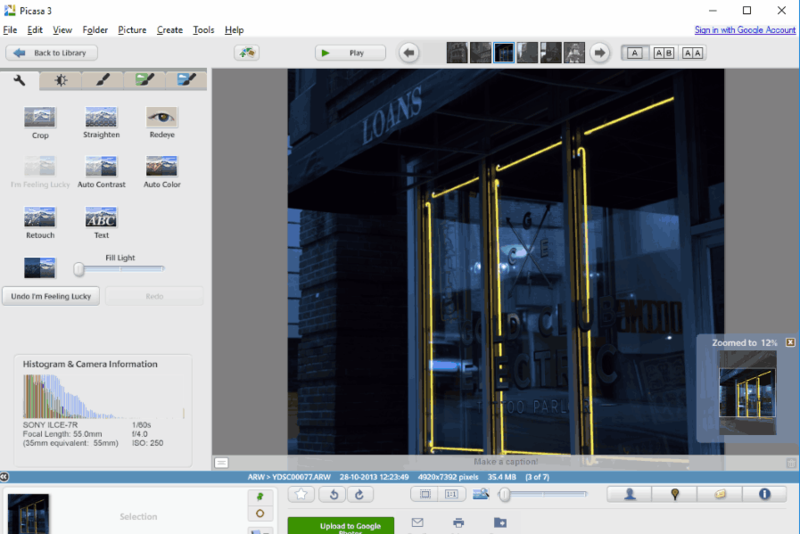 Photivo is an open source Raw image editor for Windows, Mac, and Linux. It provides a very unique interface and a wide set of tools to carry out image editing for both Raw and Bitmap photos. The tools available here let you carry out very basic to advanced Raw image editing. Talking about the tools that it provides, you can make Geometrical adjustments, color adjustments, lighting correction, Noise correction, Enhance photos, and do much more. Under each module mentioned above, you will find various options that a professional or learner may require to enhance photos. Let me mention some of the tools available: Channel mixer, Color Enhancer, Lens distortion tool, Defish tool, Spot tuning, Low/mid/highlight recovery, Levels adjustment, Noise reduction, Defringe, Tone adjustment, etc. One of the highlights of Photivo is that it provides GIMP integration. Using this feature, you can directly transfer raw photo to and fro GIMP. For this, you will have to install GIMP along with a plugin, which is available on Photivo’s website. The website of Photivo states that its designed to work on powerful computers and not aimed at beginners. Photivo supports a wide number of Raw image formats, and NEF, CR2, BAY, ARW, BMQ, CS1, DC2, DNG, KC2, KDC, MDC, MEF, MOS, MRW, NRW, ORF, PEF, PDC, PW2, SR2, SRF, SRW, STI, TIF, and X3F are the Raw image formats that it supports. You can also open and edit JPEG, PNG, BMP, and other bitmap image files here. 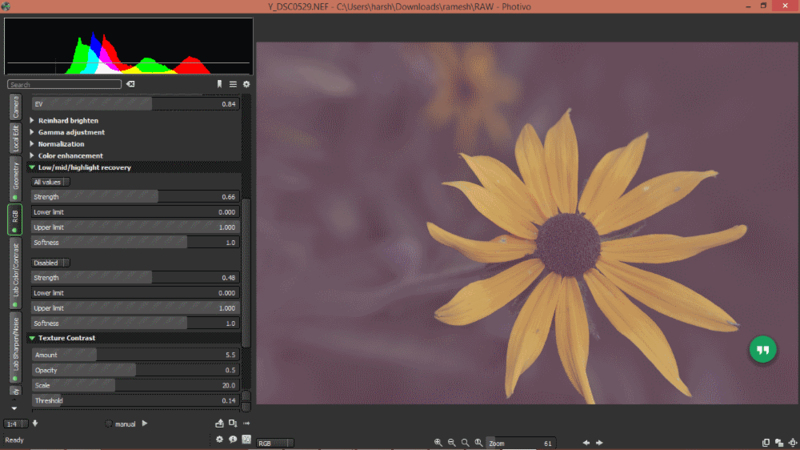 digiKam is another free Raw Photo Editing Software for Windows and Linux. It has advanced photo editing tools, and lets you carry out various operations on Raw as well as bitmap photos, such as: Color Correction, Enhancement, Transformation, Adding Effects, adding Text to photo, and much more. You can also view image properties, metedata, colors, etc. of images here. Options to save photo after editing and to export photos are also available. You can export Raw photos to PNG, JPEG, BMP, TIF, and other formats. 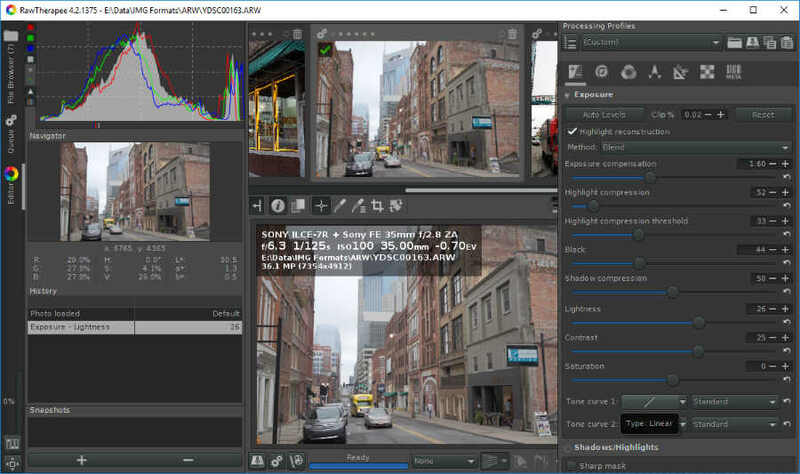 It supports a wide number of Raw image formats: CR2, STI, TIF, ARW, PW2, DNG, MEF, DC2, NEF, BAY, KDC, SRF, CS1, SRW, MDC, PDC, NRW, PEF, ORF, KC2, MRW, SR2, MOS, and BMQ. 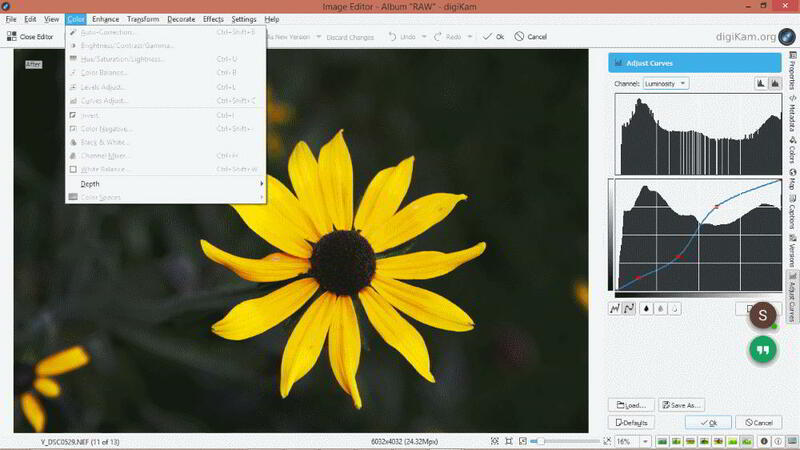 PhotoPad is a free image editor which lets you edit Raw photos as well as bitmap photos. You can only use this software for free for non commercial and personal purposes. Talking about the tools, it provides a large number of tools to edit, manipulate, and transform Raw photos. The image editing tools available here are: Selection tools, Color correction tools, Filters, Effects, HDR, Panorama, Retouch tools, Collage maker, Creative tools, and much more. You can also batch process Raw images using this software. Using these tools, you can easily edit your photos and export them as bitmap photos in JPG, PNG, BMP, TIF, etc. formats. You will also find options to share your photos directly on Social media platforms. PhotoPad is a feature rich Raw Image Editor and beginners must give it a try. Raw Image formats supported by PhotoPad are: CR2, ERF, RAF, MEF, MRW, NEF, ORF, RW2, PEF, RAW, R3D, SRW, X3F, ARW, RAS, etc. 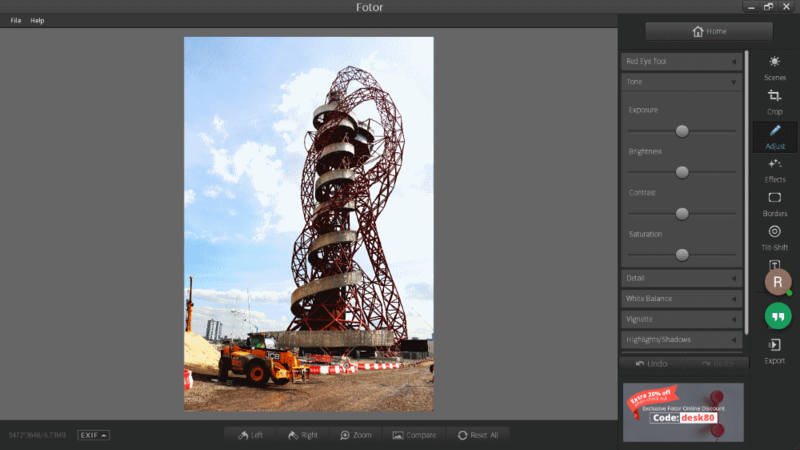 Fotor is an amazing Raw image processing software that lets you open and edit Raw photos of multiple camera formats. Along with color correction and adjustment tools, you will find various filters, effects, and other image manipulation and transformation tools on Fotor. It lets you open Raw photos of various camera manufacturers, such as: Canon RAW, Fuji RAW, Hasselblad/Imacon RAW, Leica RAW, Mamiya RAW, Nikon RAW, Panasonic PAW, Pentax RAW, and Sony RAW. You can also open and edit other bitmap images, such as: JPEG, PNG, GIF, TIF, PPM, etc. One of the options lets you view complete EXIF info of loaded images here. Once you have edited your photo is FOTOR, you can export RAW photos in various formats, or share them directly on Facebook, Twitter, or Fotor. IrfanView is primarily an image viewer, which is also capable of editing photos. You can edit Raw photos of numerous camera Raw formats in IrfanView. Although the list of image editing tools available here is not vast, but you can make basic transformations and adjustments on images here. IrfanView as an Raw Photo Editor, lets you crop images, rotate images, add text to images, flip images, change color depth of images, covert images to grayscale, make color correction, add effects, swap color, and much more. As a photographer, I would only use IrfanView for slight touch-up to make my photographs look more attractive and presentable. You cannot use IrfanView to make major edits to Raw photos or other bitmap photos. Using Irfan view, you can edit SRW, TIF, STI, ARW, MOS, NEF, ORF, PEF, PDC, MEF, SR2, NRW, DC2, BMQ, PW2, KC2, MRW, BAY, SRF, KDC, MDC, DNG, CR2, CS1, etc. Raw image formats. FastStone Image Viewer is another image viewer based Raw image editor. Unlike IrfanView, it has a good collection of image editing tools. You can resize, crop, flip, set DPI, Remove red eye, Use clone stamp, Adjust light, Adjust Color, Adjust Levels, Sharpen, Blur, Reduce colors, Add effects, Lossless rotate photos, and carry out batch operations on photos. The image editing as well as image viewing experience are very good with FastStone Image Viewer. Also the folder tree based image browser easily lets you look through photo albums to find photos you are looking for. FastStone supports a large number of image formats including Raw image formats of famous camera manufacturers. Picasa is a vary famous, but discontinued image editing software which supports Raw image editing. It is still available for download on various software hosting websites. Picasa supports Raw image formats of famous camera manufacturers, which includes: RAW, ARW, CR2, DNG, NEF, etc. In Picasa you can carry out basic image editing and add various effects on your photos. You can also transform your images here. The tools available let you Rotate, Adjust contrast, Adjust colors, Sharpen photo, Correct red eye, Add text, and do much more. Picasa’s interface is pretty easy to work with and lets you edit photos with a nice workflow. RawTherapee is a dedicated Raw image editor for Windows and Mac. This Raw photo editor is aimed at photography professionals to let them make various fine adjustments to images and get a desired result. Use the tree based image browser to load photos and edit them here. Click on a photo to open it in the image editor space. There’s a lot of color, light, levels, and transformation based adjustments that you can make. Exposure adjustments, Shadow/Highlight adjustments, Tone Mapping, Retinex, Vignette Filter, Graduated Filter, Sharpening, Contrast, Noise Reduction, White balance, Vibrance, Channel Mixer, HSV Equalizer, Color Toning, Wavelet toning, Touchup, Crop, Resize, Demosaic, Chromatic Aberrations, etc. 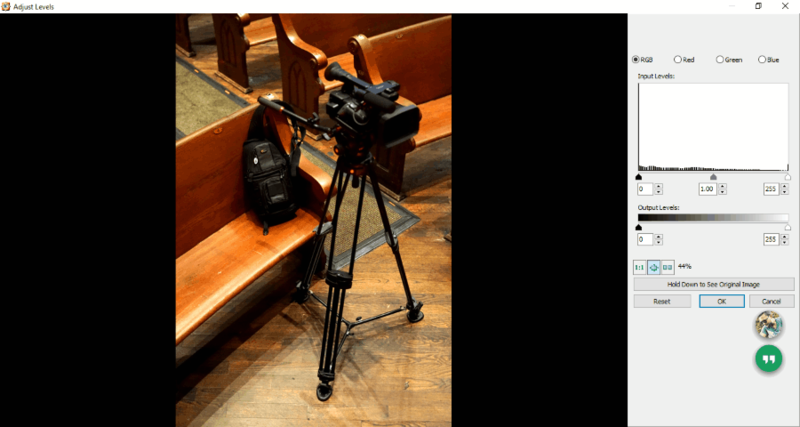 are some of the tools that you can find in RawTherapee to edit Raw photos. You can apply changes to a photo, and save the profile to apply the same set of adjustments on another photos. Its a full-fledged raw image editing software and is a suggested option for professional photographs. Supported Raw formats for RawTherapee are: SRW, MOS, CR2, SR2, NEF, MEF, BMQ, NRW, SRF, DNG, ARW, BAY, PW2, ORF, DC2, MDC, MRW, STI, TIF, PEF, KDC, CS1, PDC, KC2, etc. 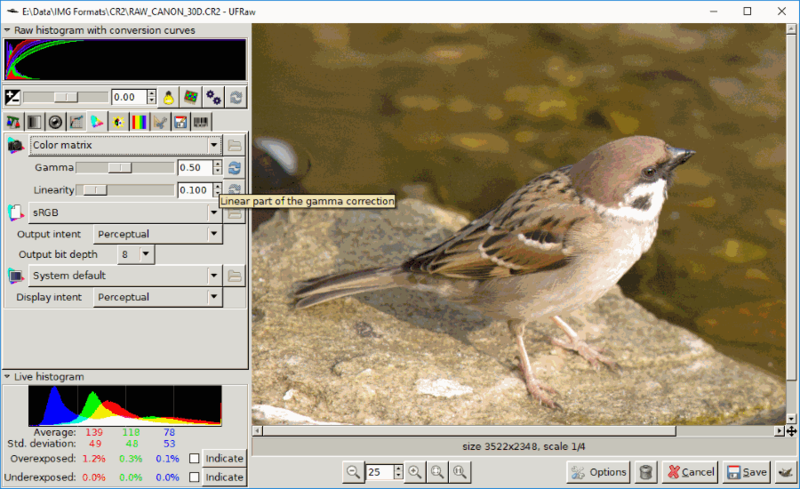 UFRaw is another dedicated Raw image editor for Windows, Mac, and Linux. The image editing tools are very neatly arranged on the interface and lets you easily find out the tool you are looking for. The tools to edit RAW photos are available in various tabs; these tabs are: White balance, Grayscale parameters, Lens Correction, Base Curve, Color Management, Correct Luminosity/Saturation, Lightness Adjustments, and Crop and Rotate. To save an edited RAW image, you can choose output format from JPEG, PNG, or TIF. You can also define image compression parameters and choose if you want to keep EXIF data. Some of the popular Raw image formats that this Raw image editor software supports are: CRW, CR2, NEF, PEF, PEF, SR2, ARW, and RAF. You can edit Raw photos in Paint.Net pretty easily. Paint.Net does not supports RAW image formats natively, but can open and let you edit Raw photos which the help of RawLoader plugin.To make this plugin work for Paint.Net to open Raw files, download the plugin. Unzip the downloaded file, then copy the 3 DLL files that will be available after you unzip it. Now go to the following location on your PC and paste the DLL files there: C:/Program Files/paint.net/FileTypes. Now start Paint.Net or restart if already open. You will be able to load RAW files in Paint.Net. Paint.Net is a very famous image editor and can help you make various adjustments on a photo, be it Raw or bitmap. You can carry out Transformation adjustments, Color adjustments, Level adjustments, add text, add objects, add effects, add filters, and do much more with the help of available tools. You can also expand the capabilities of Paint.Net with the help of many plugins available for it. The file formats that this raw image editing software supports are: Raw, Dng, Nef, Crw, Cr2, Mrw, Raf, X3f, and Orf. 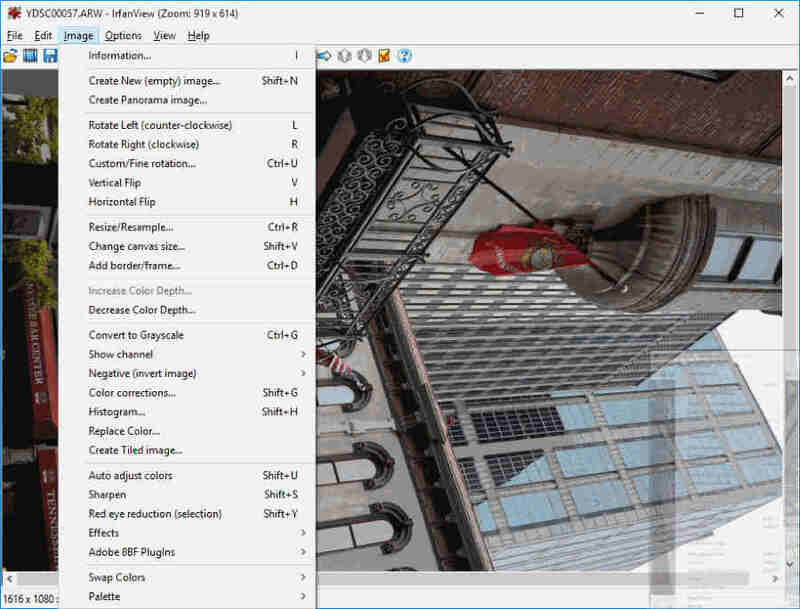 Chasys Draw IES is another good image editor software that supports Raw image formats. You can easily open and carry out Raw image editing here. This Raw image is absolutely free to use and can help you carry out a wide range of editing on images. You can not only make various adjustments here, but you can also add text and objects to your photos. Tools to add Effects and Filters are also available here that let you manipulate your photos and make them look better. You will be amazed by the set of tools that this Raw image editor has. It supports most of the known Raw image formats and bitmap image formats.